This is the best animated movie to be released this year. 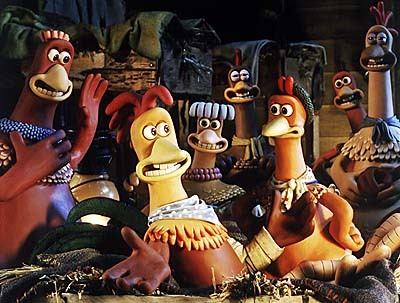 Although "Chicken Run" is rated G, adults will find this film just as enjoyable as the kids. The film has a great sense of humor. Nick Park, Peter Lord, and Aardman have created yet another fantastic adventure. Although Wallace and Grommit bow out this time in favor of a chicken named "Ginger", the film still has the magic that we have come to expect from this group of filmmakers. The story borrows heavily from "The Great Escape" and "Stalag 17" except this time it's the chickens that are the prisoners. They want off of Tweedy's Farm before they become fillings for Mrs. Tweedy's Pies. Led by Ginger they are determined to escape somehow. The animation is terrific. You completely believe that these chickens are alive. Additionally, you care about what will happen to them thoughout the course of the film. Every detail is used to enhance the plot and move the story foward. Disney and Dreamworks traditional animation departments could learn a lot from this little film. It stays "on track" and does not get lost in mindless musical numbers and stupid sidekick jokes. There is a dance number in the film but it fits well within the context of the story and is quite funny. Reduced to its essence, this is a joke told by a person, not a corporation--and that makes all the difference. It is my opinion that Nick Park and Peter Lord along with John Lasseter and Andrew Stanton at PIXAR are the true successors to Walt Disney. The films that these individuals are producing are much closer to the old Disney classics than anything that has come out of the traditional departments in decades.